Landing a number 1 song can do amazing things for a music act's career. 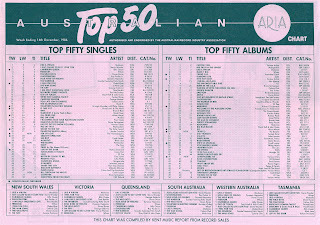 Take the two female singers who debuted on the ARIA top 50 this week in 1984, both of whom had hit the top of the singles chart earlier in the year. For one singer, she'd been on a roll ever since her number 1 hit, while this week marked the other's long-awaited follow-up to her chart-topper. Both were never more consistently successful than in 1984. Another female artist moved up to number 1 with her first chart-topper this week in 1984. Madonna ended Stevie Wonder's stranglehold on the top spot as "Like A Virgin" began a five-week stint at the summit. After two straight top 10 hits, the latest single from Breaking Hearts crashed and burned for Elton John. "Who Wears These Shoes" was a top 20 hit in the US, however. Another near-miss for Pseudo Echo, with the fourth and final single from Autumnal Park joining "Dancing Until Midnight" by peaking just outside the top 50. Oddly, "Stranger In Me" was left off later compilation Best Adventures in favour of two album tracks. After achieving their first smash with "Pride (In The Name Of Love)", it was back outside the top 50 for this second single and title track from The Unforgettable Fire. The song was released in Australia four months ahead of Ireland and the UK. What a year it had been for Cyndi Lauper, with a chart-topping debut single and a pair of number 6 hits already to her name. In fact, she was so massive at this point that she could release a fourth single from her already successful She's So Unusual album and see it reach the US top 5 without the support of a music video. 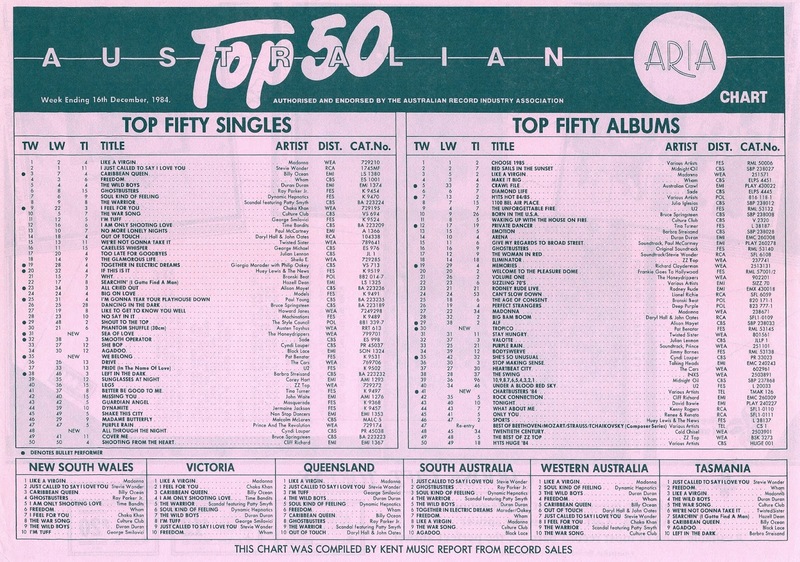 In Australia, "All Through The Night" was a more modest hit, but still made the top 20. Like "Girls Just Want To Have Fun", "All Through The Night" was a remake of a little-known song - in this case, a track from the debut album by singer/songwriter Jules Shear, Watch Dog. Cyndi transformed Jules's jangly rock tune into a synthy pop ballad and even got him to record backing vocals for her version. The two also collaborated on a couple of other songs, one of which, "I'll Kiss You", also made her album. 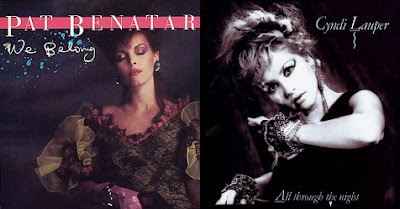 Like Cyndi Lauper, Pat Benatar had reached number 1 earlier in 1984, and almost a year after "Love Is A Battlefield" started its climb to the top, she finally returned with the follow-up. The lead single from fifth studio album Tropico, power ballad "We Belong" was a change from the feisty rock chick anthems we'd come to expect from Pat. Despite the shift in style, the kiddy choir-featuring tune was another big hit - the second of three top 10 hits she'd enjoy in Australia. The track was penned by songwriters Eric Lowen and Dan Navarro, who'd try their hand at performing their own songs in the early '90s. Speaking of shifts in style, this cover of the R&B hit by Phil Phillips with The Twilights (which reached number 25 in Australia and number 2 in the US in 1959) wasn't quite what you'd expect from rock legends like Robert Plant, Jimmy Page and Jeff Beck. In their guise as supergroup The Honeydrippers, however, the members of Led Zeppelin and The Yardbirds, together with keyboardist (and David Letterman's band leader) Paul Shaffer, Nile Rodgers and assorted other musos were free to experiment. Like the original performer of "Sea Of Love", The Honeydrippers would be one-hit wonders, but in their case, it was by design, with the project wrapped up after the runaway success of this single. Next week: the final chart for 1984, including four debuts by festive records. Plus, a look at the top 100 singles for the year. Sports by Huey only been in the Top 50 for 2 weeks? I thought it was a stayer for most of 1984. Strange they released it so late. 'Sports" actually was released on 23 January 1984, but didn't chart (in the top 100) until November.